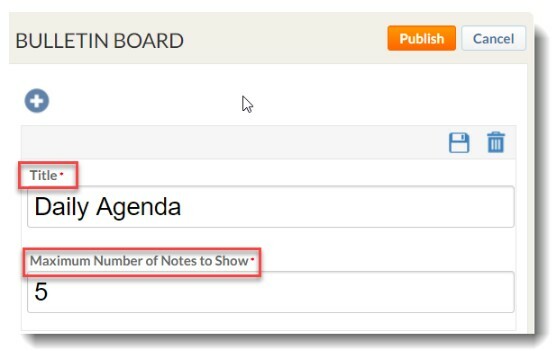 The recommended way to create a daily agenda is by adding a Notes module to your Bulletin Board. The same could be done by adding a daily Text Module, but the page will take increasingly long to load and update before becoming unusable, as it would allow for multiple users to edit a single page, while the Notes module allows users to edit only a particular agenda. Head to one of your assignments under Course Management. Click Edit beside Bulletin Board. 3. Click the “Plus” sign and choose Notes. 4. Choose an appropriate title and set the number of notes to display. Keep in mind that a Show All Notes button will be available for students to read older posts. When done, click Publish. Click the Add Note button (1) in the Bulletin Board. Fill out the form and click Publish. The note will appear on your Bulletin Board.